SNAFU! : Patria shopping its AMV brand? Patria shopping its AMV brand? Patria has negotiated the sale of parts of the company's Land business to Poland. The Polish PGZ group is interested in the AMV vehicle and the Hämeenlinna factory. Jakub Skiba, Managing Director of PGZ, announced in Rzeczpospolita that the company will buy Patria. The news has been published with a title that can be translated into Finnish "PGZ has a hunger for Patria". “Yes, but I cannot say anything else,” Skiba answered on whether Patria is being bought. In the interview, Skiba introduces Patria's AMV armored vehicles and the fact that his company wants the rights to it. The Rosomak company belonging to the PGZ Group already has restricted access rights to AMV vehicles. It manufactures vehicles for the Polish Army and has also sold them abroad. Patria does not dispute Skiban's statements and negotiations with PGZ. Patria's Communications Director Birgitta Selonen says the company is aware of "speculation". “It is natural that business management and owners are constantly discussing various business structure discussions with various parties,” Selonen said in a written answer, adding that according to the company's practice, it does not comment on rumors. Polska Grupa Zbrojeniowa (PGZ) is a Polish state-owned defense industry group with more than 60 Polish companies. These companies have more than 17,500 employees. Rzeczpospolita published an interview with CEO Jakub Skiban already at the end of August. After that, Skiban's statement on buying Patria is also borrowed from other Polish media. According to Hämeen Sanomat, Patria has also been negotiating the sale of its Land business with Britain’s BAE Systems. BAE Systems is a defence giant with a turnover of tens of billions of euros. Patria bid in Australia for the supply of new armored vehicles together with BAE, but failed to win the billion-euro order. Negotiations with BAE Systems did not lead to any kind of deal. The company is topical in Finland as it manufactures Eurofighter Typhoon aircraft, which is one of the options for a new Finnish Air Force fighter. The Poles are interested only in the Patria AMV armored vehicle. AMV has been developed at the Patria Hämeenlinna factory and vehicle product development has been extended all the time. Among other things, the AMX XP version, which Patria holds as a completely new armored vehicle. Poland was the first country to buy the AMV 8 × 8 from Patria. An order for 690 vehicles were signed in 2004. In Poland, the AMV armored vehicles are called Rosomak. Patria’sn Polish partner Wojskowe Zakłady Mechaniczne, who assembled most of the vehicles and received limited product IP rights, changed its name to Rosomak SA. Poland has ordered hundreds of new AMVs from Rosomak after the 2004 order. CEO Skiba says in a press interview that the Rosomak will be assembled in Poland under Patria license. PGZ would like to have the rights to sell these vehicles abroad. Patria's own AMVs have been under way in recent years. No major orders have been generated for the vehicles. The order of the Finnish Defense Forces on a domestic product was left on 62 vehicles, with a 24-vehicle AMOS mortar vehicle. The Hämeenlinna factory has been quiet lately. 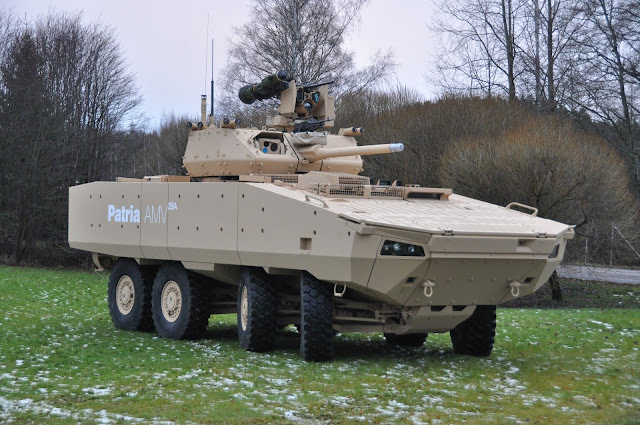 Patria has dismissed hundreds of employees, but Hämeenlinna still has a strong AMV product development. Disappointing. I thought they were doing well but I guess the abortion that was the team up with Lockheed for the USMC Amphibious Combat Vehicle contest along with the failure in Australia spelled the beginning of the end and they want to divest themselves of the armored vehicle portion of their company. BAE would be a good home but somehow I think PGZ would be better stewards of the brand. They really can't lose with either company but with PGZ I think we'll see further development, while with BAE they'll just be another corporation under the big tent.